This is an almost new apartment situated on the Costa Esuri resort with its golf course. Faro airport is a 40 minute drive. Ayamonte is 4 km away, with its many restaurants and bars, shops and market. Arguably the best beach in Spain is only 15 minutes drive away. For golfers, the position is ideal - a course on site and another 10 within easy reach, including Islantilla and Monte Rei, Quinta da Cima, Quinta da Ria, Castro Marim and Quinta do Valle in Portugal. Seville is 130 km on motorways and easily reachable for a day trip. 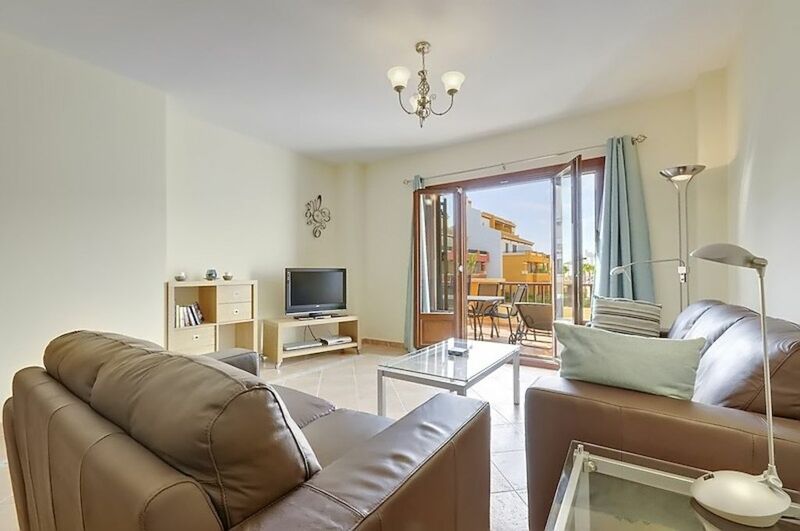 This is an excellent apartment suitable for both a family holiday and a golfing break with friends. The accommodation is very good with three bedrooms over two floors. There are views over the golf course from the upper floor as well as the complex. There are all the facilities needed in the apartment. The patio outside the lounge and bedroom is wonderful with ample chairs and recliners. Also the important sun blind to get some protection. This overlooks the well maintained gardens and pool. It is well maintained on a secure gated community. It is generally very quiet. The lounge has large comfortable leather sofas. The area is very nice and makes a good change from the western Algarve. The beaches along this cost are long and sandy and you don't get the high rise buildings of the other Spanish resorts. A car is essential to get around. Ayamonte is a very pleasant town still very Spanish and not too commercialised. There are lots of restaurants in Ayamonte some very good. There are notes on where to go in the apartment. There is a restaurant on the complex at Costa Esuri. This has changed ownership recently so I cannot comment on the food but previously it was very good. The bar at the golf club is open to all and it is very pleasant to go down there and have a drink with views over the golf course. The Mercadona supermarket on the way into Ayamonte is excellent and provides for all your needs. If you need supplies on a Sunday then you have to go over the bridge back into Portugal to the town of Vila Real. of 4)! The accommodation was top class, spacious and bright. Just perfect!! washing and eating-in a pleasure. Ayamonte is a lovely seaside town to explore, but a car is a must for this area (Mercadona, a good supermarket, is about 5 minutes drive). Beware of the Portuguese road tolls…they are very expensive. (*tip* if flying into Faro and you’ve got the time, use the secondary roads to get to the apartment!). Check out the Esuri golf course (on-site)…good course/ great value. Visit Seville, a 1 and ½ hour drive, and also check out the Rio Tinto mines north of Huelva. We found the Spanish people very welcoming and helpful and most speak very good English. The rental company “Purple Parrot” was helpful when called on. ayamonte has many restaurants to choose from and again the food was lovely we found the tapas bars were a great choice so you can choose different dishes . Nice house, as in the ad. With everything you need, or almost. Costa Esuri is on the Costa de la luz (Spanish Algarve), right by the border with Portugal. Ayamonte is nearby and a couple of miles further is Isla Canela. The nearest airport is Faro, and Seville is also easily reachable. Monte Gordo and Castro Marim are just over the border in Portugal.